Since 2005, New Product Blueprinting interviews have evolved until they now only faintly resemble traditional VOC. Why? 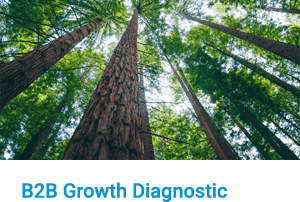 Because they’ve been refined and field-tested in tens of thousands of B2B-only customer interviews. 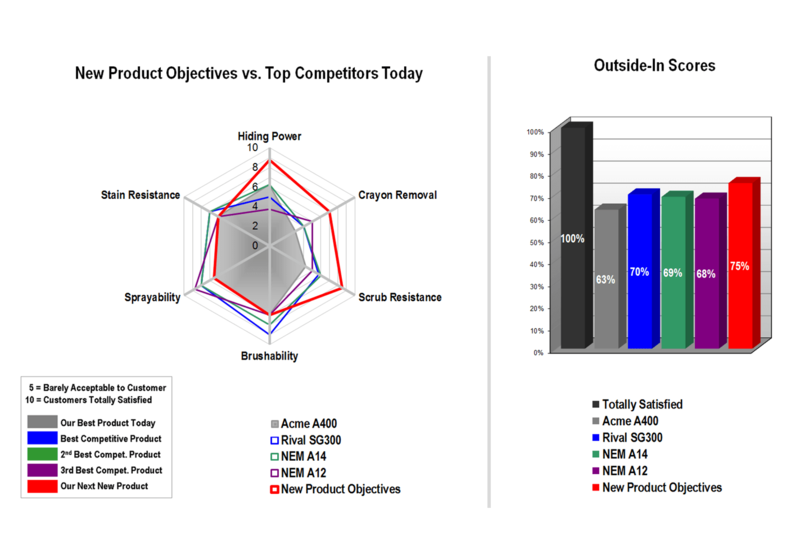 If you want better customer insight, use the world’s leading B2B VOC approach, not hand-me-down consumer-goods VOC. 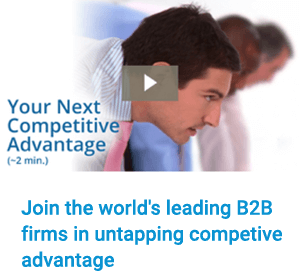 You’ll be amazed at how much you can learn from insightful, objective, interested B2B customers. When you know how to ask. Whenever possible, you’ll use a digital projector to capture customers’ ideas. This completely changes the interview dynamics, since customers don’t have to guess what you’re scribbling or typing. Blueprinter® software lets you record and sort their comments on digital “sticky notes”… creating a shared “idea-generation” atmosphere. This also allows for real-time corrections and greatly impresses customers. These interviews set you apart in customers’ eyes long before your new product arrives. Most VOC training encourages you to develop brilliant questions in an interview script. 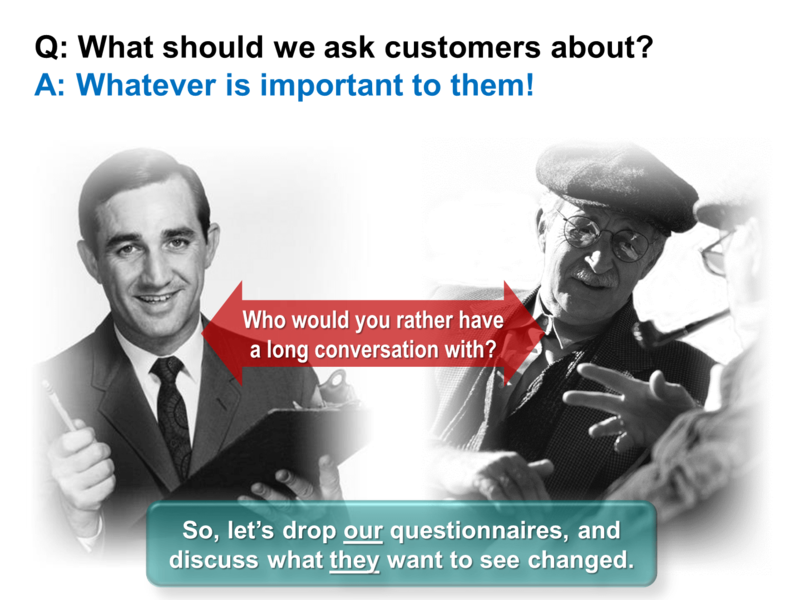 Instead, we teach you how to brilliantly probe any customer responses. 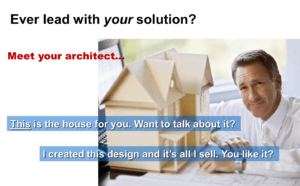 You ask a few simple questions and then follow customers’ lead… as they direct you to the areas they are most concerned with (all within your project scope, of course). Customers feel like you are really listening to them… not just filling in your questionnaire. Customers say they find this refreshing. Your commercial people have been trained to sell and your technical people to solve. But in Blueprinting interviews, they just search. 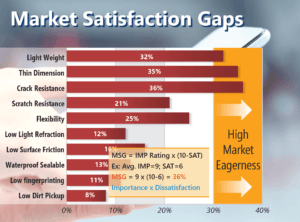 They use highly-refined probing techniques to uncover market needs your competitors completely miss. Blueprinting is very intentional about staying clear of solving (which wastes time and jeopardizes your intellectual property) and selling (which wastes time and makes you appear self-serving). Many companies say they want to understand market needs… when they really just want to “validate” solutions developed in their labs and conference rooms. If your new product development process begins with an “idea,” it’s usually your idea, not your customers’, right? No wonder most new products fail! Blueprinting inverts this process, so you start with market needs and then look inside and outside your company for the best solution. Traditional VOC interviews often call for hours of transcribing, interpretation and analysis. Your B2B customers are capable—and usually eager—to help you understand and prioritize their needs while still in the room with you. And unlike B2C techniques, where they feel studied and observed, this interaction is a respectful discussion between professional peers. Your interview team has a short post-interview debriefing… and they’re done. 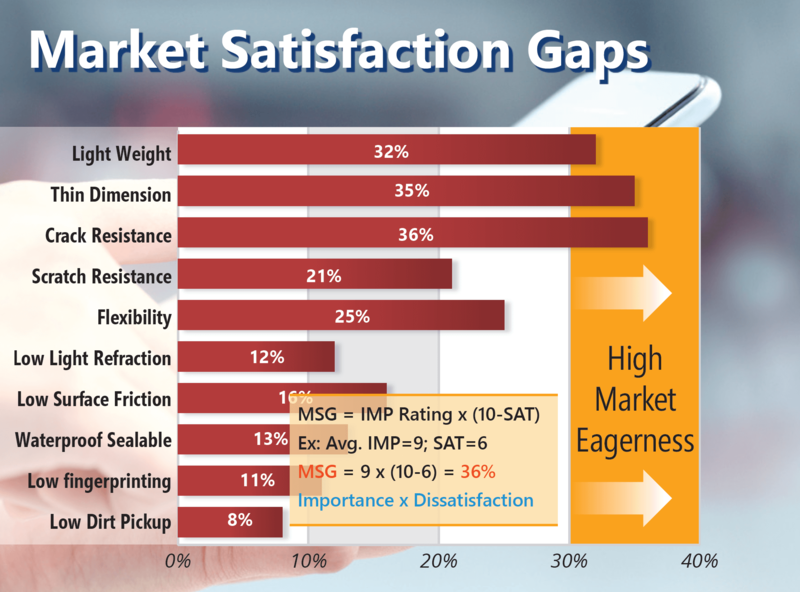 When you conduct Preference Interviews in a second round of customer visits, Blueprinter® software generates Market Satisfaction Gaps (MSG). Customer outcomes with MSG over 30% indicate the customer is eager for change. In some cases, you’ll learn customers are already satisfied: So instead of developing a product for this market, you’ll drop the project… and celebrate! This is how companies stop squandering scarce R&D and marketing resources. Unlike B2C producers, your product might be part of your customer’s customer’s product, or even further down the value chain. We teach advanced techniques to help you go down this value chain to understand all relevant needs. And while B2C producers assign “one vote” per consumer… you’ll assign weights for the buying power of B2B customers. Blueprinting lets you do this with simple but powerful quantitative tools. 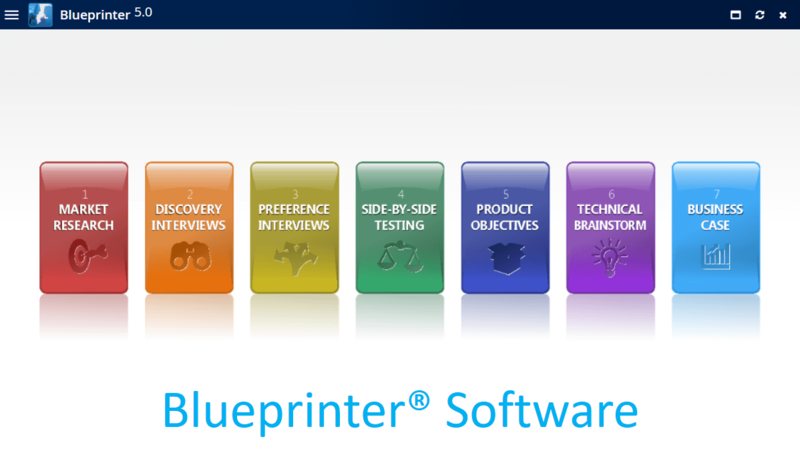 Blueprinter software helps you set product objectives based on data from interviews and competitive testing. 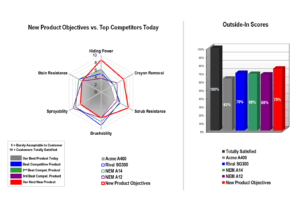 Visual tools let you view “what-if” product designs, predict market reaction to each, and select the best. Resulting value propositions—void of wishful thinking and internal bias—are captured in a 12-point venture-capital-quality Business Case. You can use this as a stand-alone justification or as a supplement to your existing stage-and-gate process. Instead of using many unconnected tools, you’ll capture the entire front-end of product development in Blueprinter software. Your teams will have a natural “roadmap” to follow, so the best market insight practices become second-nature throughout your company. And years from now, others in your company can search cloud-based Blueprinter software for critical market needs. Most companies “don’t know what they know”… but your company will! Don’t rely on a handful of internal experts for hearing your customers’ “voice.” With our proven training methods, your marketing, technical and sales people—who are constantly visiting customers anyway—will uncover customer needs day in and day out. Don’t outsource this work to VOC “hired guns.” This is a strong competitive advantage you need to own. Guessing at Customer Needs: Download this white paper and see why 5 out of 6 teams significantly change their product designs… after they conduct Blueprinting interviews. Reinventing VOC for B2B: Learn the new rules for B2B-optimized voice of customer (VOC) in this e-book by Dan Adams.